If you are a fan of Adirondack moose or my blog, she says humbly, then you know moose are hard at work repopulating the Adirondacks with their massive species. As you might also be aware, there are some moose who, like many of us, seem to enjoy the wild and wonderful ambiance at Cascade Ski Touring Center and Knickers the cocktail spot, on State Route 73, just outside the Village of Lake Placid. 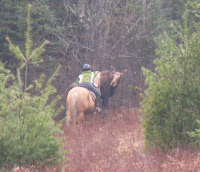 As a matter of fact, just this past weekend, Ms. Moose was hanging around in her usual spot when the pictured horseback rider approached for a pet. Turns out, the horseback rider was lucky she didn't get a stomp instead of a pet. Come on people. I'm no biologist, although I sometimes stay at a Holiday Inn Express, and I know better than to approach wild animals. Especially those animals who are about six times the size of me with sharp hooves and no English skills who won't understand my cries for mercy.